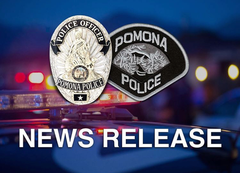 During the past several days, the Pomona Police Department’s Major Crimes Task Force (MCTF) has been actively conducting VICE operations, specifically targeting prostitution on the eastern side of Pomona, along the area commonly known as the Holt Corridor. The operation used surveillance tactics with undercover vehicles as a way to covertly locate and contact individuals engaging in prostitution. During the two day sting, the Major Crimes Task Force arrested six people for loitering with intent to commit prostitution. The Pomona Police Department is taking a proactive approach to improving the quality of life by addressing and deterring human trafficking and prostitution activities along the Holt Ave corridor. Anyone with information regarding this incident is urged to contact the Pomona Police Department at (909)620-2085.